My Latest Invention: Turn Your Home Into An Immunological System’s Paradise. Live Longer and Healthier. Last March, I posted the following at my Survive a Toxic World Blog. Now, I have my final commercial device finished. It is 10th generation. It works and works extremely well. Simple, effective, low maintenance and highly functional. I, also, have my portable device finished. My portable device is pictured below, in the article. My latest generation survivetox device is housed inside of a vacuum cleaner (to take in contaminated air and blow out sanitized air). I expect that this device will be the most important contribution, to humanity, that I will ever make, with my life. I discovered that the immunological system of a person is similar to the capacity of a car battery. It has a specific amount of capacity, to be available for use. Our bodies are under constant attack from exposure to bacteria, virus, mold, microbes, pollution and other toxins. All creatures whether as small as a bacteria or as large as an elephant must eat to survive. Our digestive system is exposed to deadly threats while we introduce ‘energy’ into our body via our digestive system. The process of using life energy results in by products of solids, liquids and gases. Several of my other inventions utilize this understanding to perform unique and special, positive consequences. This same principle applies to the bodies requirement to intake Oxygen from the atmosphere and into our bloodstream via our lungs, sinus, skin, ears and eyes. This intake of Oxygen, also, exposes the body to danger. Our immune system protects us. Most of our ‘life energy’; that is, the capacity of our immunological system is used to protect our ‘exposure’; while we absorb Oxygen and ‘energy/nutrients/water’ into our body. As with all life, we live in a world that is designed to reduce everything to its basic elements. All forms of life are under a constant battle to survive. We are completely surrounded by billions of microbes that would kill us if our immune system failed to defend us. In sick people our immune system can be overwhelmed with this battle. When your immune system is overwhelmed; then you die. This is the life and death process of our world. I have changed that. My device has changed that. My device creates an immunological challenge free environment for my body. This enables the ‘capacity’ of my immunological system to be applied, towards my 911 injuries and NOT to be used for the ‘routine’ environmental challenges of life. By creating an immunological challenge free environment for my body, I have enabled the ‘full force’ of my immune system to be diverted away from protecting my body from exposure to virus, bacteria, mold, pollution and other toxins. I am healthier, by far. My 911 injuries and health issues have diminished and my General health has seen a tremendous improvement. My Doctors have used words like: ‘amazing’, ‘incredible’, ‘stunning’ and ‘impressive’. They have ALL told me that my logic, reasoning and ‘medical understanding’ is without error. Apparently, nobody thought about it; except for me. My final version uses specific light frequencies, high voltage electricity, and I change the molecular structure of my home atmosphere. All virus, mold, bacteria and every single molecule of pollution is removed without any negative side effects. removing chemical smells from garages, factories and refineries (If you can smell it then it has entered your bloodstream via your sinus). sterilizing the insides of fridges, walls, microwaves and other appliances where chemical cleaners cannot reach. Curing Bladder and/or yeast infection, in women, in 5 minutes without side effects and without antibiotics or any other crude treatment. Curing World Trade center caused diarrhea. Immediately curing certain types of skin disease. Completely removing body odor from gyms, locker rooms, work-out bags, workout shoes and clothes. Making sick rooms healthy, for patient and visitor. Allowing fresh, clean sleeping during the bedroom, at night. Mona Lewinski would have had no proof of sexual conduct if her dress had been ‘blasted’ with this machine. No smell, no trace remaining. Sterilizing, public event portable toilets and removing all odor. Immediately sterilizing open flesh wounds, killing the bacteria and stopping the infection without the use of any antibiotics. I am sure that there will be hundreds of uses: all resulting in a longer life, less illness and better health. I find new uses almost every day. Continued below….I will put up pictures and video later…. 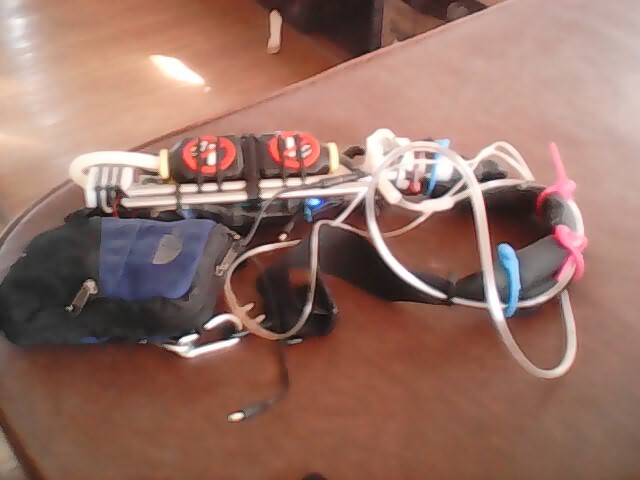 I plan to give this device away, for free to third world Health Care Systems, for use in Hospitals. This will reduce mortality, reduce hospital stay, reduce use of pharmaceuticals and provide better health at a lower cost. I have, also, designed a mobile EBOLA treatment facility using some of this technology. I will, also, give this away, for free. The pictures you see below and the article, below, published, 6 months ago are obsolete. Now, my device is much smaller, simpler, more effective and very impressive looking. Disclaimer: My device/machine/process works and has done and continues to exceed my expectations, in extremely positive and delightful ways. My machine detoxifies the home. Plain and simple. This has an extremely positive effect on every immune system….plain and simple. I am now using the machine directly on my own body. I do NOT plan to introduce this device to the USA or Canadian Health/Medical Business. I have no desire to go thru 10 years and hundreds of millions of dollars fighting pharmaceutical companies protecting their profits. I will; however, give it away for free, to Health Care Systems that are NOT profit driven. I make it clear. I am using this machine on my own body. That is my business. I make no claim for any effect that it will have on anybody else and I make no claim to do anything for anybody. I use it on myself to cure myself. That is my business. As with all my inventions, I make them to solve a problem; that I am confronted with in my ‘life’s work’ or in my ‘life’. USA and Canadian medical processes have helped. Also, French, German, Chinese and Japanese medical processes have helped my health, to keep me alive. I have 3,200 pages of medical documentation from 75 Doctors and medical Specialists who have helped me. They are at a roadblock. I am not. I will cure myself. My machine will cure me. Period. My business. My choice. At the Bottom of the Page you will find 8 different business opportunities created by my machine. The Story Behind the Doug Copp Odor Removal/Detox Machine. Eliminate all foul odor/pollution/contamination/toxins/bacteria/virus, from your home or business; at a greatly more effective and reduced price; than currently available. This device required 28 years, in development. This will greatly benefit most sick people; by making their homes a healthful sanctuary for their immune system. Our prices will be very reasonable, for this service and The American Rescue Team International will voluntarily help people; at cost or free who do not have the resources to pay. This device has been tested by ARTI and is certified to be 100% effective at Toxin Removal. Environmental illness is simple. Everybody knows this: drink too much arsenic and you will die. Drink enough to get sick; but stay alive and you have environmental illness. Toxic chemicals that don’t kill you make you sick. Ingest enough poison to kill most people and stay alive then you will have a hyper vigilant immune system, like me. The tiniest re-exposure can cause convulsions, attacks and can be fatal. Most environmental illness is a consequence; of over-exposure to manufactured chemicals. The manufacturers of these chemicals want the most profit they can get. What is the limit of greed? Just like tobacco companies spending fortunes to deny that cigarettes cause cancer and other diseases; the chemical manufacturers do the same. This equipment helps the sick cope with their illness; in spite of, the malfeasance of the greedy. 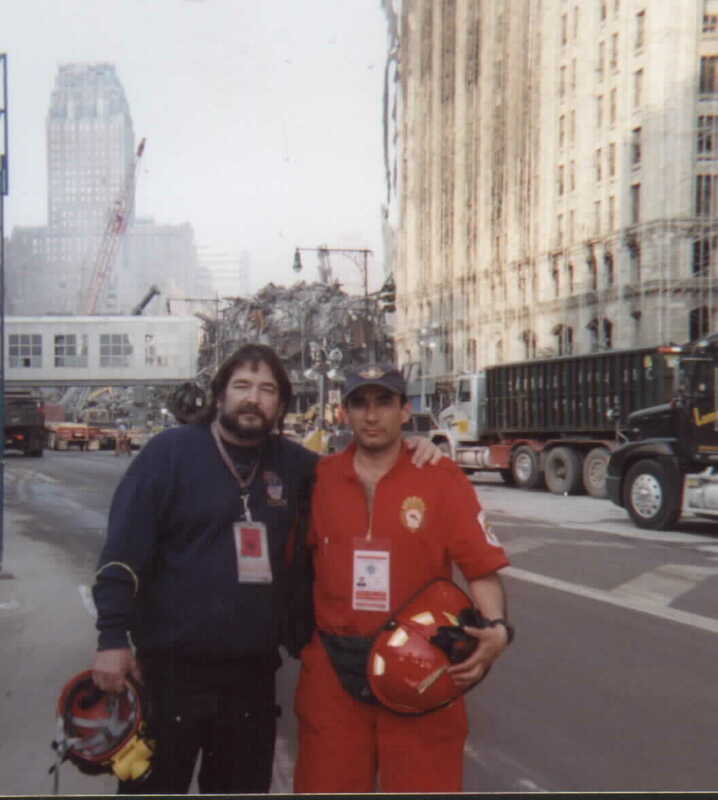 Over exposure to toxins is what happened to me; as a result of, searching the subterranean floors of the World Trade Center; while the fires were still smoldering and the air was thick with poisons. Doug under the 911 rubble. 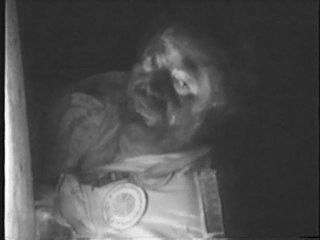 Doug Copp at the surface of 911, covered with toxic grease, inside his lungs and on his body. 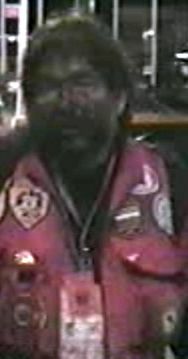 http://www.youtube.com/watch?v=H5Dr5y-RPQs I have severe environmental illness. At one point, I had 47 simultaneous illnesses. At www.dougcopp.me you can examine my 3,200 pages of personal medical documentation; including, 175 lab tests. I was a ‘vegetable’, blind, couldn’t speak, soaked with fever and was expected to die at any moment. Now, in 2015, I have cerebral edema, toxic glaucoma, central nervous system damage and several other environmentally caused illnesses; including a hyper vigilant immune system. My immune system overreacts to a tiny exposure to the same World Trade Center toxins. The tiniest exposure can cause me to have convulsions and can kill me. It is and was a ‘matter of survival’. My machine saved me. **April 16, 2015: I have started using my device which I used to detox my home, to detox my body. I have been treated by My Doctors for diarrhea on a continuous daily basis, for 18 months. My Doctors have been unable to stop it or cure it. I used my device to treat a glass of water. I use the water as a catalyst device to infuse the 3 OX molecules generated by my device. I drink the water on an empty stomach. The 3OX molecules go into my blood stream and alter the molecular structure of suspended toxins in my blood stream. These toxins are molecularly altered and converted to non-toxic molecules which then drop out of suspension and can be processed by my liver and kidneys; before being eliminated from my body. As I eliminate toxins from my blood, my tissues and bone will keep leaking toxins back into my blood stream. This process will continue until all toxins are eventually eliminated from my body. I started 7 days ago. Every am I drink a glass of my processed water. I have NOT had diarrhea for 6 days and counting. I am now developing this process to cure my cerebral edema, toxic glaucoma, acid reflux disease, hyperthyroid, hyper vigilant immune system and neurological damage. I expect that I will have my acid reflux disease cured within a month. At that time I will cease my prescriptions, for acid reflux disease; which I have taken every day for 14 years. I expect that my other medical problems will be resolved within 2 years; except for the hyper vigilant immune system disorder which I expect to take 3 years. The entire effect of detoxifying my body is being helped by my device; which, has reduced the environmental immunological, ‘normal challenges usage of my immunological system capacity. My immune system has increased it’s ability to actually ‘work’ against my illnesses, by my living in a challenge free environment. The Commercialized version is ready, for use. Efraim Huaman aka ‘Pancho’, ARTI team member, from Peru, living in Mexico and I will be demonstrating this equipment to Mexican Government Authorities and Television; during April of 2015. Pancho and Doug at 911. I remove all nitrogen from the air inside the building. Only Oxygen remains. I change the molecular structure of the Oxygen molecules to be unstable with an extra Oxygen atom. I change the electrical charge of the Oxygen molecule to be unstable with a negative charge. 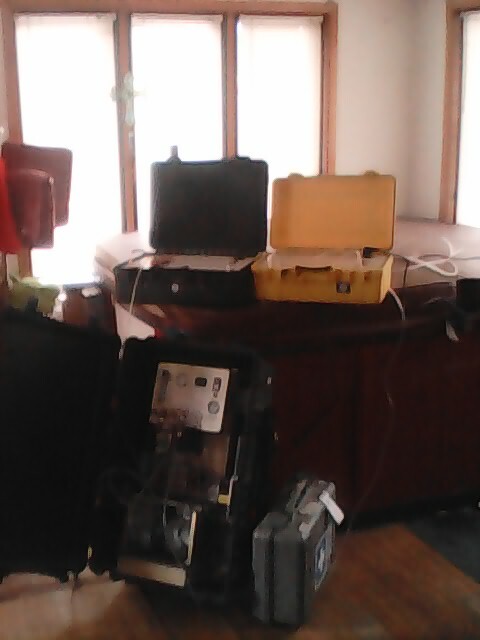 I use specific light spectrum bandwidth to kill virus, bacteria, mold and fungus. I pressurize the ‘atmosphere’ inside of the building. The unstable molecules, under pressure, go inside of every nook and cranny, compartment, area of every kind. When they confront a molecule of pollution they attack it. The unstable molecules ‘cling’ to the pollution particle, changing it’s molecular structure and neutralizing it’s electrical charge (It goes from a positive charge, to a neutral charge.). The unwanted molecules of pollution/odor/contamination clump together; until, they become so heavy; that they fall from the air, as dust. At this point, the pollution/contamination cannot be ‘smelled’. The toxins cannot enter your blood stream though your sinus and lungs. The area has no odor. It is not harmful. It can be dusted up in regular housework cleaning. A room that had been destroyed by the smell of a dead decomposing body, undiscovered for a couple of weeks; would normally require $10,000 to $30,000 cost to remove carpet; throw away mattresses, bedding, clothes etc…etc..tear down walls, paint, and the use of harsh chemicals to scrub inside the walls…..is completely gone, without a trace. The equipment only needs to be plugged in and left for a day or two; depending on the concentration of the pollution. The process is the same with house fire smoke smell etc etc etc … Also, there is no negative effect on humans, all mold, virus, bacteria are killed. It creates an extremely healthy environment with minimum work and effort. The air becomes fresh and clean. My home, after the house fire, was an environment that would literally kill me dead, in 10 minutes, if I went inside the doorway ( Standing on my front lawn, I had an attack, from the adjusters clothing, within 1 minute of exposure to him standing 20 ft away from me.). When I first started to detoxify my home; I treated it like it was deadly, to me; like an Infected Ebola clinic. I wore a tyvec suit (no body part was exposed). I wore a gas mask. I slid open the door wide enough to put my machine inside, turned it on and quickly shut the door. I let the machine run, for days. Then I quickly went inside and moved the equipment to another section of my home and continued to run the machine. I created ‘negative air pressure zones’ of pure air; until my home was safer than a Hospital Operating Room. The only ingredients were ‘air’, ‘electricity’ and ‘light’. No chemicals, toxins of any kind were used. For my environmental illness, my home became an immunological system paradise. Now, my home makes me feel great. It has never been this good. It is fresh, vibrant, healthy and it allows my immune system to rest and build strength. This is the only year, of my life; that I can remember never having a cold or the flu. Every time I think about my machine and what it has done I laugh and giggle and think OMG…WOW! This is incredible! Thank You Lord! This equipment works miraculously. I am the proof of it. My environmental illness is extreme. For most people; it is only necessary to plug my machine; into the electrical outlet and run it for a day. This will purify the home. As a demonstration; I take a jar with a dark, black, rotten, decomposed piece of meat inside. I remove the lid and the smell will drive everyone running away; thinking that the odor will never be removed..that the place is destroyed. I turn on my equipment and the odor is completely gone, in less than a minute. Only a fresh smell remains which makes you want to take a deep breath. The meat turns from black to a fresh, rosy pink. It all happens, in front of your eyes and your nose, within seconds. It is very, very impressive. To The General Public we would invite them to get quotes and then I would charge 10%-20% of the ‘normal/standard/commonly used ‘ charge from competitors. I plan to franchise this business, in different markets, with partners. Specifically, I will be looking for contracts and to set up this business; when I come to Southern California; in 2015. Some Uses: house fire restoration, commercial fire restoration, factories, refineries, chemical plants, hospitals, medical clinics, Ebola Mobile Medical Facilities, funeral homes, city morgues, welding shops, auto repair garages, public toilets, hotel rooms, meeting rooms, restaurant kitchens, bars, train stations, airports, city dumps, garbage processing facilities, facilities for portable toilets and homes of victims of severe allergies and environmental illness…. etc etc etc. Mansions/Penthouses of Billionaires, Presidential Palaces and domiciles of the wealthiest/most powerful people, in the world, can be made to give a healthier and longer life expectancy, to them; as my home already does, for me. All odor, all pollution, all toxins, all bacteria, fungus and mold destroyed; leaving a fresh smelling, healthful and safe environment. Now, I offer this equipment to make our world, a better place. My websites; confirm the 250,000 lives; that I have saved as an unpaid volunteer. Now, I will donate most of my profits to Government certified charities who are highly effective, at concluding positive results. Good things can come from bad circumstances with the desire, will, determination and a good heart. It so wonderful to breathe fresh, clean air. A Healthy home is a sanctuary for your immune system. Doug Copp Considerations: ***I am already field-testing a mobile, portable device that allows me to go to toxic areas and not be killed. It creates a 3ft radius safe zone; while walking and a 20ft safe zone; while sitting. It allows me to fly, on a plane, without risking my life (perfume/ cologne knocks me unconscious). For me, it is like a cripple getting up out of his wheelchair and running. I can do things and go places that I have been unable to do; since, Sept. 27,2001 (When I first fell ill and went to the Hospital unable to breathe). Worn with a shoulder strap the mobile air purifier safe zone device. It has 3 modes and can provide 24 HRS of safety on a single charge. 1) Business Opportunity Worldwide: Using Doug Copp’s technology and the training of ARTI (American Rescue Team International); i.e., ‘the world’s most experienced rescue team’ to create ‘ The Safest Sanctuary Zone’ status to Hotels, in the major Cities; throughout the world. These Hotels will be an immune system paradise; as well as, the safest from natural disasters; in the region. 2) San Francisco: looking for a partner, to create a ‘Safe Zone Sanctuary’; as a building location, in San Francisco. 3) Looking for a ‘Time Share’ expert to sell time shares, for ‘enviro paradise’ ownership, at designated locations, throughout the world. There is a facility immediately available. 4) In major cities, like NYC, using the detox unit to kill Bed Bugs rapidly and without toxins. 5) In cities like Mexico City using the detox unit to kill cockroaches. 6) In countries like Cuba, the Middle East and Africa using the Detox Unit to sterilize Hospitals cheaply, rapidly, completely and without side effects. 6) For people with environmental illness, like me, to live a far better life. 7) In war mass, mass murder recovery and toxic sites, to sterilize the ‘workers’ without using chemicals. 8) Mobile Ebola and pandemic Treatment sites/hospitals/mash units to eliminate virus without chemicals. 9) To sterilize food manufacturing plants; without chemicals and to eliminate every single bacteria, virus and molecule of toxin where liquid chemicals can not reach or be used. 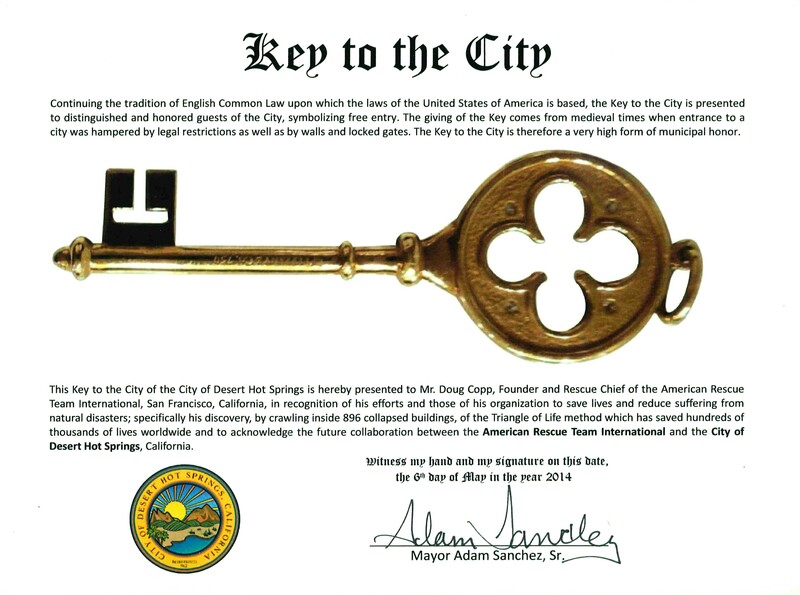 Doug Copp ‘Keys to the City’, for saving 250,000 lives, at disasters. 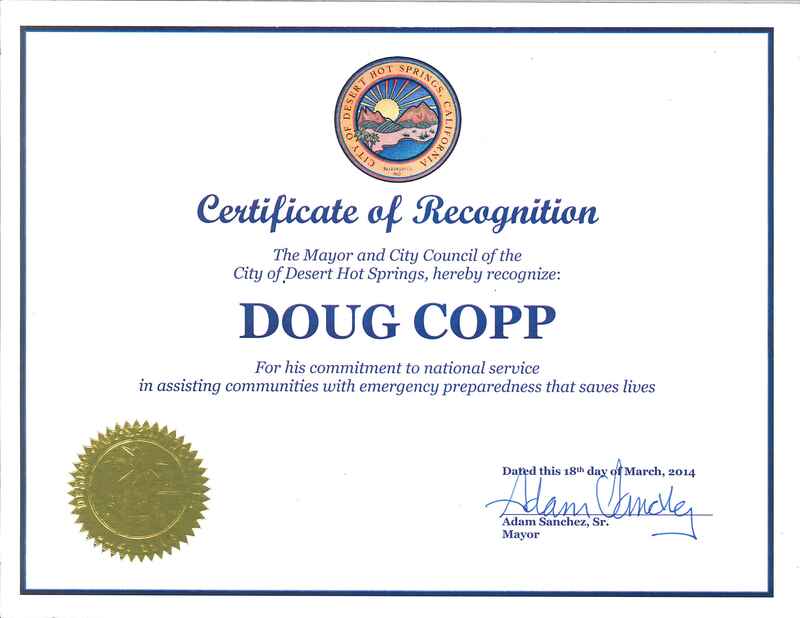 another of 2,000 thank you letters and awards received by Doug Copp for Humanitarian work. I have posted an add ; as a business opportunity, for my invention/device/process. There are positive responses and a very negative one. I want to show the ad and publish the email correspondence, of the very negative response; so that the truth/facts be known ; as well as, clarifying my intentions/motives/goals. Go to http://www.survivetox.comI am finishing building (in 2 weeks) my final 27 mode of operation equipment that can ‘shock’ detox an entire building, in 1 hour. I use light, electricity and air. My Device, destroys all bacteria, virus, mold, insects, toxins, air borne pollution molecules of all kinds. No chemicals, no side effects. Smoke residue from fire, chemical spill, household pollution, even a dead body decomposing for 1 month. All gone in 1 hour.To demonstrate I take a jar with rotten hamburger: I open the jar and within 5 seconds the overwhelming putrid smell is gone and the black rotten meat turns bright red. My invention. I live in Sydney (most of the year) and am establishing service distributors/franchises in California, Mexico and South America. I do NOT want to sell or distribute the device. I do want to build a finite number of machines with partners, in different parts of the world (I have worked/travelled/saved lives in more than 100 countries.) 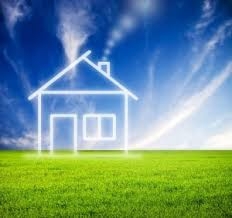 to provide the service: for the sick and environmentally ill, insurance companies, homeowners who have had fire and smoke damage, people who want to live in a healthier home that is environmentally and immunolgically ‘challenge free’. I have 2,000 plus written testimonials and thank You letters from world leaders. I have saved or been an intrinsic part of saving more than 300,000 lives. I am interested in helping people and making the world a better place more than $$$. I want partners to do the business and money part; while I continue with my life goals of humanity service. Since this add was posted I have played a very important part in the Movie San Adreas. Dwayne ‘The Rock’ Johnson gives one of my Scientific Discoveries as the reason why he could save 50 lives. Go to http://www.dougcopp.me to read about it. What are you talking about? Are you crazy? it says not found. Give me the actual link and i will sue.Don’t believe every psycho on the internet. You obviously need help. There are resources for you. Everyone is not a scam. Evil people do evil things. lol im just playing with you so tell me more about your ad what were you looking for? Precisely what it says. My invention is worth a lot of money and I am too sick to make money and save lives. I chose to save lives. I need a businessman/partner to run the business. I am an honest man and do not play games. As you learn more about this invention/device/service it becomes clear that fortunes can be made. I have had many opportunities to ‘cash out’ and receive great wealth. There was always a choice between using my life to become another useless rich man or use my life; as if it was important and had value. I chose to save lives and make the world a better place. I had started using the device to cure my 911 illnesses by directly using the device on my own body; via my digestive system and blood stream. Initially, my brain soared and I felt like a powerhouse dynamo ; both physically and intellectually. This occurred; as I swept 911 toxins away, from my bloodstream. Here is the problem: More toxins flowed from deep inside of my bones and deep tissue; eventually moving via tissue cells back into and saturating my bloodstream with toxins, again. My expectations are: 1) I will be sickly and have many bad symptoms and pain; as I remove the flow of poisons out of my body. 2) This suffering will last until the poisons are totally removed.3) This movement of toxins is causing much cell damage to my entire body.4) Hopefully, all poisons will be removed within a couple of years and then my device will work on destroying cancer cells and repairing cell damage.5) The disappointment is that I won’t be feeling like a dynamo again until all the toxins are removed; like they were initially removed from my blood. 6)So, I must endure a couple of years of personal suffering; until my health improves to a semblance of pre 911 levels. UPDATE: Major Breakthrough. April 6, 2015. By May15, 2015 I will have finished building a NEW Commercial detox device with 17 different operating modes. In the 17th total ‘shock’ mode a typical home will be completely detoxified of all bacteria, virus, fungus, insects, toxins, odors of every kind and every intensity..within a 1 hr operating time. This will replace the device mentioned in the article, below. Oil Companies: Climate Change is a fraud. Pharmaceutical Companies: Non prescription remedies are a fraud. USA and Canadian medical Establishment: Alternative medical procedures used in Europe and Asia are FRAUD. There is no limit to greed. Anything that interferes with profit is a fraud. My device works. It worked on my home and now it is working on my body. This entry was posted in Uncategorized and tagged chemicals, environment, Environmental Illness., health, survive, toxic free. Bookmark the permalink.